What if she didn't want earrings when she got older? I came up with reason #1 so that I wouldn't have to get Bailey's ears pierced when she was a baby. Being a new mother (and a little squeamish of needles myself), I could barely get through Bailey's immunizations without having a total meltdown. Unnecessary needles seemed...well... unnecessary. Friday night, I took Bailey, Drew and my niece Claire to the mall. We walked by the accessory store Claire's (which my niece proudly claimed as her own) just as someone was getting her ears pierced. Bailey stopped and watched as this little girl screamed her bloody head off. Awesome. Later it was time to leave and I said, "Okay, let's go get a cookie, get Bailey's ears pierced and head home." I was just trying to make light of what we'd seen earlier at that accessory temple of doom. But Bailey said, "Okay, Mom. I'm ready for earrings." You could have swept the floor with my jaw as it dropped open. What a brave girl! Bailey walked into the store, selected her bling, and hopped into the chair. Then we waited for years (okay it was only 15 minutes, but felt like years) until two associates could assist us. Getting both ears pierced at the same time was a must! Bailey was totally calm - even waiting. I asked her if she wanted to hold my hand, but she said that she didn't need to. 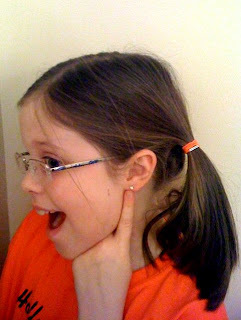 And when they pierced her ears, she didn't even flinch. She didn't shed one tear. I remember when I got my ears pierced at Bailey's age. My sister Delane, who is two years younger than me (about 7 at the time), thought a little ear decor sounded nice, too. So, I gave Delane the honor of going first. Seemed like the polite thing to do. Then when she screamed, I decided that earrings could wait. Mom explained how unfair it was to talk my sister into doing something and then back out. So what does any super tough and incredibly brave 9 year old girl do in this situation? Cry and hide under the coffee table, of course. They literally had to pull me out from under the table and hold me in the chair to pierce my ears. It's a wonder that I don't have an earring through my cheek with all the nonsense that I was creating. Bailey is clearly much tougher than I am. And prettier than I could ever hope to be - inside and out. I am so proud of her!